What is better than a juicy, fruity, tasty salad on a summer night? Close to nothing after you try this recipe. It hits both the sweet and savory taste buds! 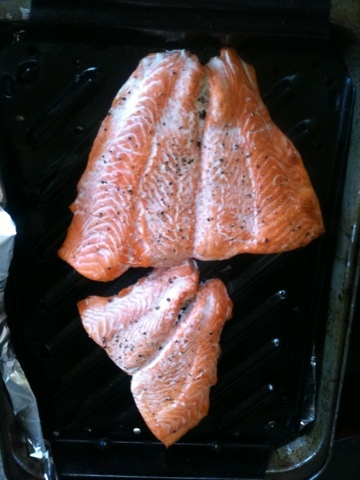 My amazing client brought me the freshest salmon her husband caught just yesterday!!!!! I had to enjoy it, and it needed to pop! 1. Oven on HI broil. Cook fresh salmon with a bit of pepper and sprinkle of salt for about 10 minutes! 2. 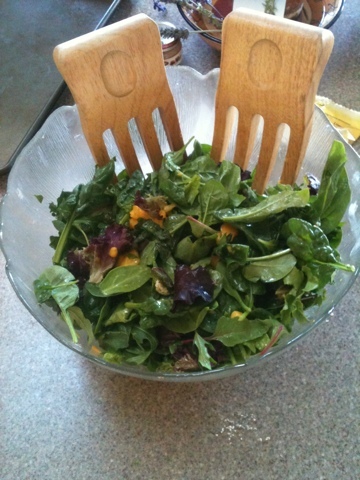 In large bowl add lettuce, finely chopped basil, chopped mango chunks, small pieces of cheese. 3. 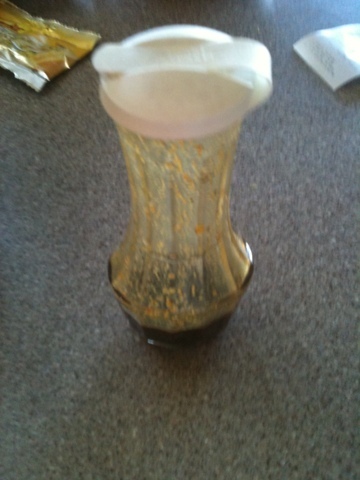 In a dressing shaker add 3 tbsp. Balsamic, 1 tbsp. Evoo, 1 tbsp agave, 1 tbsp mustard, shake of salt-free garlic. 5. 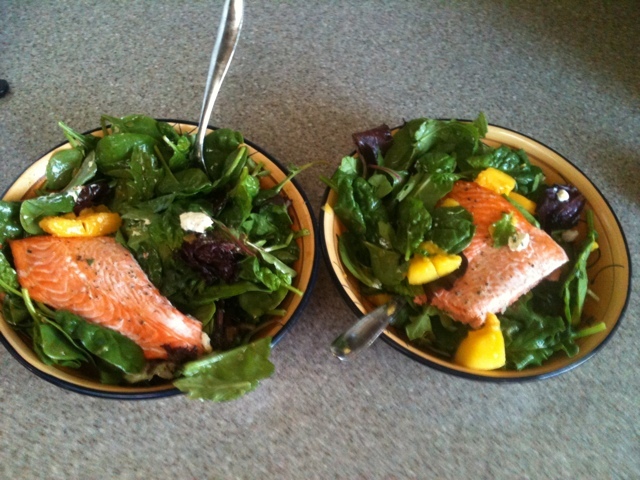 Serve salads in small bowl, and place filet of salmon on top! I have never been so flattered with compliments like I was this past weekend. Every time I ran in to people I haven't seen in a while I was lucky to have been spoiled with kind words. I couldn't help but feel spoiled with love. I was SO happy that people rooted me on and told me I inspired or motivated them (those are the best two compliments I could ask for). I noticed, people actually got the fact that I did this competition to challenge my mind and body, not try to look good in a bikini on a stage. That wasn't my reasoning for competing at all. Knowing that I can help others reach their goals by motivating them is why I continue to push hard every day. SO NOW IT'S YOUR TURN. START WORKING HARD, MOTIVATE PEOPLE, AND TRANSFORM. It isn't easy to change old habits. Think about it, you have created these habits over years and years. The change won't happen overnight, but the consistency of working towards a change makes it a lifestyle. It took me about a year to lose the freshman 15 I gained. People gave me a hard time for about...... A YEAR. The only thing that kept me going was....ME. Knowing that I needed to make the change kept me working hard. How to make your change: Start adopting more healthy habits! I.e. If you workout 3x a week shoot for 4. If you eat healthy 3 of 4 meals then shoot for 4 of 4. If you workout 30minutes then shoot for 1hour. If you eat out 3x a week eat out 2. Start small, and these little changes will change your life. I promise. I started by ordering salads out. Then salads with no candied nuts, then changed to getting no nuts or cheese on my salads. A few weeks later no nuts, no cheese, and no dressing. Small changes make BIG differences, up to 350-400 calorie differences!!!!!!!!! You can transform your habits, which will then transform your mood, and your BODY. Now is the time. Start your transformation, you are the only person who can transform YOU. It is your responsibility to control your happiness, confidence, and you have the power to change! I KNOW SOME OF YOU ARE GLUTEN INTOLERANT, RAW, VEGAN, OR VEGETARIAN. THIS IS JUST A SAMPLE LIST, YOU CAN MODIFY ACCORDINGLY!!! !